On the preceding page in my "Dragonfly Journal" — this hit-and-miss collection of photo essays chronicling a first year of interest in odes — I announced the "end" of the dragonfly season. Reports of the season's demise were premature. The day after I posted my "final" page, I found Monterey's first California Spreadwing, and on 22 October Monterey's first Paddle-tailed Darner was found by William Hull. So while the season is winding down — even the ladybugs are clumping together (left) — it is still going . . . The upper reaches of Cold Canyon in Solano County (near right). This is very close to Monticello Dam which holds back Lake Berryessa in Napa Co. To help us find this elusive giant, we arranged to meet Kathy & Dave Biggs (far right; its L to R: Rita, Kathy, Dave) to show us the ropes here. There are pluses and minuses in venturing out into the wild with Queen Odonata. On the up side, when the going gets slow, Kathy may just dig through the muck and locate a dragonfly nymph (right), this one apparently an Argia dancer. This had all been entertaining but two hours had gone by, and there were still no flying odes to observe. Perhaps the the cool, overcast day was to blame — and we are in Cold Canyon. Perhaps there was a good reason for this name. Finally, at 2 pm, the sun broke through and, as if it had been choreographed, Dave found the first spreadwing! Dave and I had clambered far upstream (left) and while he remained crisp and neat as an REI model, I had fallen into the creek several times . . . But it mattered not: the male Great Spreadwing is in the sun (below), with nothing but (sort-of) blue skies beyond! Alas, the location of this first spreadwing was too far upstream to be reasonably reached, so Kathy and Rita went off to look for their own spreadwings. Kathy netted a male (above left) that she and Rita examined in hand, checking out the appendages with reference material (above right). It proved to be a male California Spreadwing. Over the course of the hour that the sun was out, we ended up finding 6 male Greats and 6+ male Californians in a rather short stretch of creek edge, plus at least 4 female Greats and one female California. 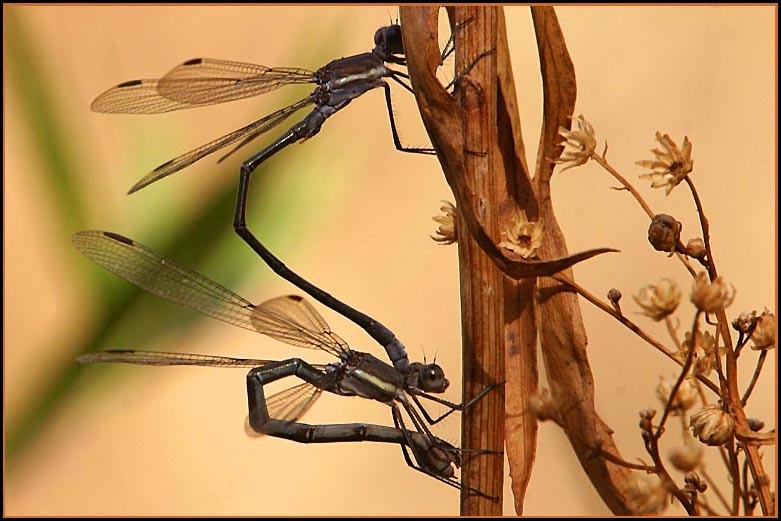 The most impressive find, though, was when Kathy and Rita found several tandem pairs of Great Spreadwing. 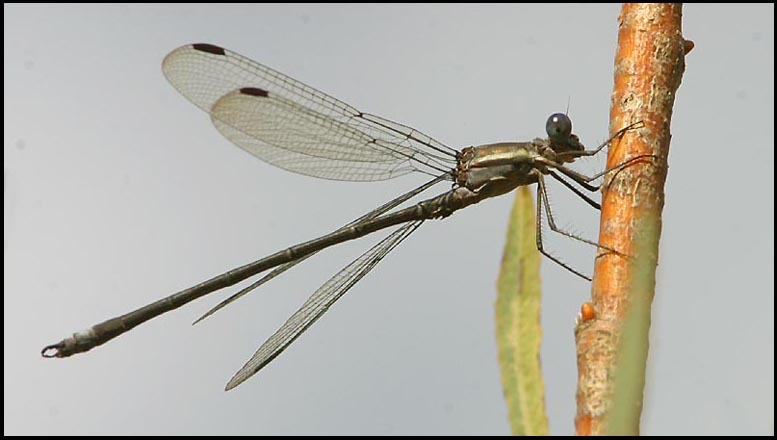 One of them (below) was watched ovipositing directly into the weedy stems over the creekbed (below). With this climactic conclusion, perhaps it really is the end the this year's "Dragonfly Journal." What started as a bit of gee-whiz gawking in June evolved into a highly focused hunt for specific species. It has been a fine learning experience along the way. Rita and I were fortunate to have some exceptional guides in this journey. We watched the mating behavior of Common Whitetails with Walt Koenig; we rummaged through drawers of specimens with Tim Manolis; we endured dusty roads to remote canyons with the Lavender Hill Man, Paul Johnson. And in the end we found hot spreadwings in Cold Canyon with Kathy & Dave Biggs. A memorable experience indeed. PHOTOS: All photos were taken 4 Nov 2006 in Cold Canyon, Solano Co., and are © 2006 Don Roberson; all rights reserved.